Longhorns with Purok and Chisun. History - told as a story might be recounted; highly anecdotal in nature. Historically, script and writing and printing were difficult in the days long, and not so long, ago. Most people were illiterate anyway and indeed many still are. It is difficult to educate nomads when it means taking children away from their families and their work responsibilities in the short time available to get to summer pastures or return before the winter season. Consequently, little had been recorded, and what was written down or published was often well intentioned but incorrect. 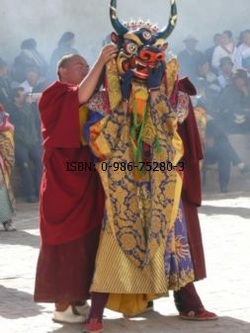 Masks / costumes - the main attraction of the cham dance to the foreign eye is the multitude and divergence of the colorful masks. This link examines how they are made, some of the masks seen most often, some details and meaning of items. Costumes worn by the dancers and significant others, and other details are also discussed. 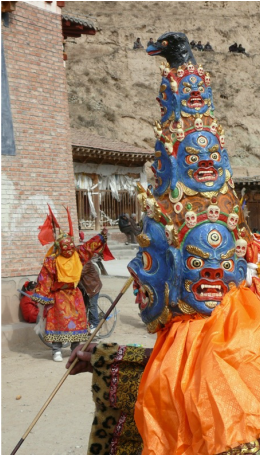 Dancers - the main ones are Dharmapalas, like Yama, Mahakala, Palden Lhamo, and Begtse Chen - names and faces that may become familiar to you. Other dancers, like Chisun and Songdong, will also be introduced along with a descriptive listing and explanation of the instruments and implements that these dancers carry ... and use! Mahakala / The Great Black - is a special deity in the cham dance and this section will expand on his emanations or characterizations, including those of his First Minister named Ksetrapala! Orchestra - a short description of cham dance orchestras, and the instruments that they use and play. 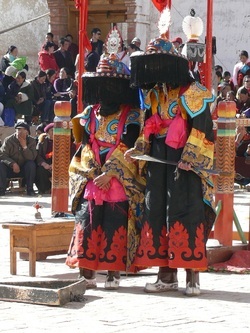 Cham Dance videos - taken at various cham dances in several monasteries. The videos enable many aspects of the dance, as previously described, to be seen and experienced as if you were there. Downloads in Asia might be slow. Cham Books - introduces my three books, one which can be obtained through the Contact Me tab. Cham Store - authentic items acquired during outings into the hinterlands. About the author and webmaster - just a few words about myself, so you better understand some of my mind's interpretive limitations. Contact Me - a page for your ideas, views and questions. Comments greatly appreciated. 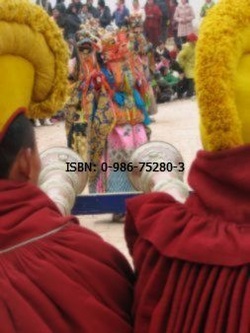 Information about obtaining a copy of 'Tibetan Cham Dancing - A Traveller's Guide' can also be requested. O ma ni pad me hum.